I have learned that by dressing the ground beef a little, you can really enhance the flavor. Today I added Worcestershire sauce, Lawry’s season salt and diced up red peppers. I topped the burgers with cheddar and monterey jack and a hot grill so you can get a nice crispness on the outside of the burger and summer has arrived! Mix 1 lb of ground chuck and 1/2 lb of ground round; then add about 1/4 cup of diced red peppers, 3 tbsp Worcestershire sauce and finish with 3 tbsp of Lawry’s season salt. In the last 90 seconds or so of cooking and 3 slices of cheddar and 2 slices of monterey jack – shut the lid to get a really good melt. 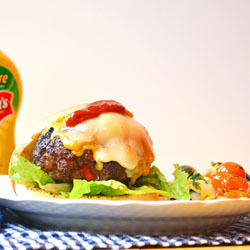 Let rest for a couple of minutes and assemble the burger the way you like – I used a piece red leaf lettuce, ketchup and mustard on a grilled bun. Hello! I wanted to say CONGRATS and let you know I Nominated you for the Versatile Blogger Award! For more details about the award, please visit: http://bargainbites00.blogspot.com/2012/06/versatile-blogger-award.html Congrats again, it is well deserved! I love your blog! This sounds like the perfect burger. Great flavor! Great recipe, Peter. Would you like to add it to Food on Friday: Beef? I love that it is in a ball who would have thought?? So awesome never seen a burger like it!